When I was a kid, the cold war was still in full swing. I saw a commercial on TV one day that scared the crap out of me. It showed a nuclear weapon blowing up. So my mom wrote to her uncle and asked him to send as much information as he could about nuclear power so I could read up on the issue. I forget how old I was, maybe 8, 10, or 11 at the oldest. But Uncle Howard sent us a box filled with information about how nuclear power plants worked. It was so boring that I couldn’t imagine how it could hurt me, but the material came in handy for a science project I had the following year. 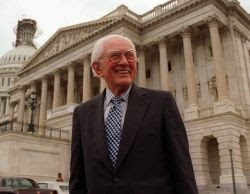 Uncle Howard was Howard Metzenbaum, Ohio’s first Jewish senator, and a man who was known both as a curmudgeon and as someone who always fought for what he believed in. And fought hard. He died last night. He was 90, and it wasn’t a great surprise, but that doesn’t make it any less sad. I didn’t know him very well toward the end of his life, but I always looked up to him. The Cleveland Plain Dealer, Associated Press, and other news outlets can probably tell you more about his life and accomplishments than I can. But I can tell you he will be missed. I’ll be in Cleveland this weekend for his funeral and to spend some time with my family.